This feature of the integration extension enables the admin to manage all the products available in the Magento 2 store and uploaded on Fruugo.com. Hence, after getting redirected to the Manage Products page from the Manage Products menu, the store owners can perform the similar tasks as they can perform on the Manage Products page after getting redirected from the Manage Profile page. The only difference here is the display of the products on the Manage Products page. Display of the Products on the Manage Products page after getting redirected from the Manage Profile page: Only those products that are assigned to the selected profile are listed. Display of the Products on the Manage Products page after getting redirected from the Manage Products menu: All the products of all the profiles are listed. Scroll down to the required profile. 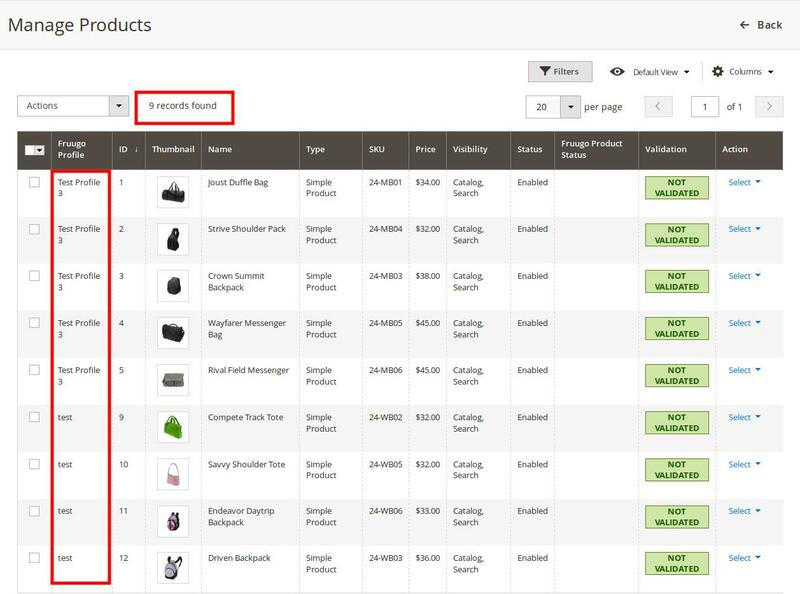 In the Action column, click the Arrow button next to the Select link, and then click Manage Products. The products assigned to the specific profile are listed. For example, in the figure, all the products assigned to the Test Profile 3 are listed. On the left navigation bar, click the FRUUGO INTEGRATION menu, and then click Manage Products. All the available products assigned to all the profiles are listed.